Berberine is a bright yellow alkaloid that is found in a variety of plants such as guduchi and goldenseal. It has traditionally been used as a dye for various textiles and as a component of traditional Chinese medicine. Berberine supplements have a wide array of potential effects with some of the more stand out effects being its ability to support our metabolism, cognition and mood. This makes Berberine hydrochloride a very versatile compound that many people can benefit from and best of all, it is a completely natural compound! 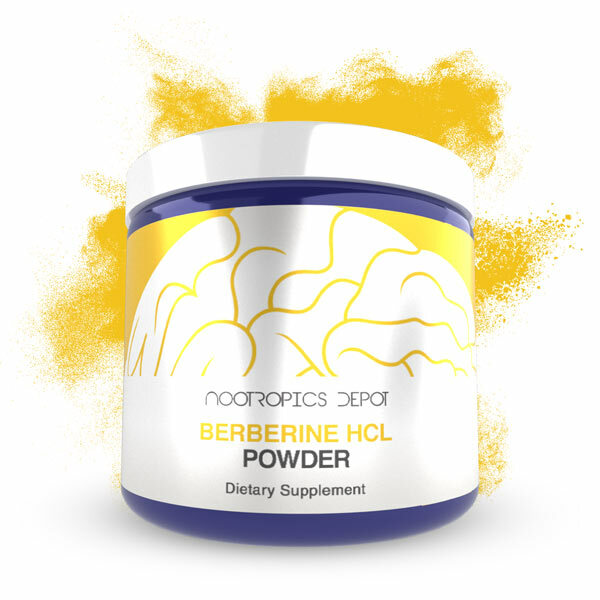 This makes a berberine supplement, containing the stabilized berberine hydrochloride (HCL) form, a great supplement for those seeking to support their metabolic health and cognitive function. This is what berberine HCL is the best known for, as its potential effects on metabolic health are significant. Most of these effects are regulated through 5’ Adenosine Monophosphate Activated Protein Kinase (AMPK). In the muscles and in the heart, AMPK activation speeds up both the uptake and breakdown of glucose through a process called glycolysis. Berberine also slows down the production of glucose via a process called gluconeogenesis while simultaneously decreasing insulin secretions from pancreatic beta-cells. The net effect of this enhanced glucose processing, is that insulin sensitivity goes up. Increased insulin sensitivity will promote healthy body composition and will help with exercise performance. In addition to this, insulin plays a major role in the brain too, and it has been shown that enhanced insulin sensitivity may help promote healthy cognitive functioning. AMPK activation also increases the breakdown of fatty acids through a process called fatty acid oxidation. AMPK activation also decreases the production of fatty acids by inhibiting fatty acid synthesis. This effect is further enhanced by AMPK activation inhibiting the breakdown of fats to fatty acids through a process called lipolysis. In addition to all of this, AMPK activation may also help support healthy cholesterol levels. 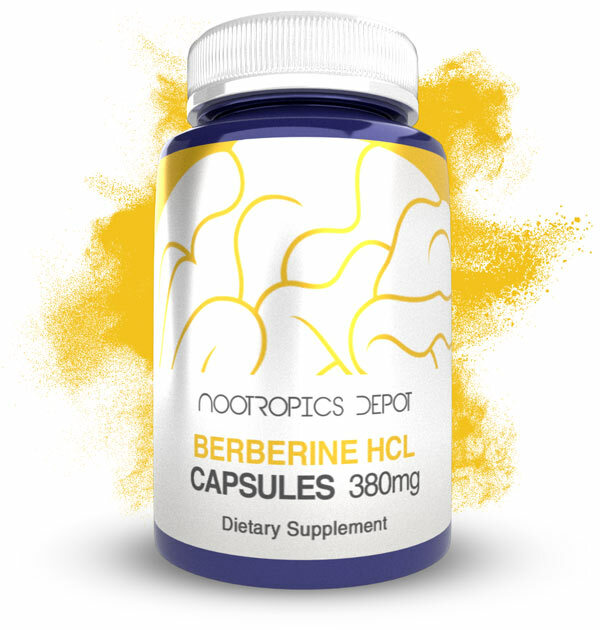 Overall, berberine HCL appears to be a very good supporter of overall health. Berberine HCL helps promote healthy glucose levels. In addition to this, berberine HCL also helps support a healthy metabolism and healthy cholesterol levels. Taken together, this makes berberine HCL a very comprehensive general health booster. Since a berberine supplement can activate AMPK, it can have minor effects on weight loss. In particular there seems to be a small preference for fat loss with berberine supplementation. However, these effects do appear to be mild, and will not lead to very significant weight loss by itself. Instead, a berberine supplement should be taken alongside an already existing healthy exercise and diet regimen, and within this context, it may help support weight loss. Berberine appears to support both mood and cognition. The main mechanisms of action here appear to occur through a receptor called sigma-1, potassium current blockade, monoamine oxidase A and B inhibition and acetylcholinesterase inhibition. The sigma-1 receptor is a fairly unique receptor that appears to modulate a wide variety of biological activities. The sigma-1 receptor is known as an endoplasmic reticulum (ER) chaperone, this means that within the ER, which is one of the main organelles in cells besides the mitochondria, sigma-1 binds to various targets and quite literally ‘chaperones’ their activity. Normally, sigma-1 is bound to another ER chaperone called BiP. Upon activation of the sigma-1 receptor, it releases from BiP and freely floats around the ER. Free sigma-1 preferentially binds to the IP3 receptor. This IP3 receptor modulates Ca2+ efflux from the Ca2+ stores in the ER. The problem with the IP3 receptor is that it is rapidly degraded after it is activated by IP3, but sigma-1 prevents this degradation due to its chaperone activity. This ultimately makes more Ca2+ available to the mitochondria and receptors that require Ca2+influx such as the NMDA receptor. The NMDA receptor modulates many cognitive functions, such as the encoding of long term memories through a process called long term potentiation (LTP). Furthermore, activation of the sigma-1 receptor causes an increase in BDNF levels. BDNF is a protein that is very important for modulating how the brain changes, and decreased levels of BDNF are associated with low mood and overall decreased cognition. Berberine appears to be a positive modulator of the sigma-1 receptor, which means that berberine makes sigma-1 receptors more sensitive. This increased sensitivity causes the sigma-1 receptor to be activated much more readily. Due to this, berberine can modulate Ca2+ efflux and influx whilst also increasing BDNF levels. This is likely what causes berberines mood suppporting effect and is also responsible for a large portion of its neuroprotective and cognition enhancing effects. Berberine activates a unique receptor called sigma-1. Activation of this receptor enhances the activity of other receptors such as the NMDA receptor, which plays a vital role in memory. Activation of sigma-1 also leads to an increase in BDNF levels which can promote both healthy mood and cognition. Berberine has the ability to make the neurons in our brains more sensitive, by decreasing the amount of potassium that can get into them. In addition to this, berberine can also enhance levels of an important neurotransmitter called acetylcholine which helps support healthy mood and cognition. Berberine also has a minor effect on dopamine and serotonin levels, which can also contribute to supporting a healthy mood.